Turkey Sliders & Homemade Slider Sauce! You are here: Home / Recipes / Dinner / Turkey Sliders And Homemade Slider Sauce! Turkey Sliders And Homemade Slider Sauce! 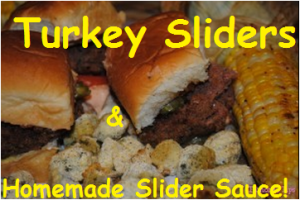 T’s back with another great recipe: Turkey Sliders and Homemade Slider Sauce! Since Tax Deduction #3 is my self proclaimed Chef Extraordinaire, he decided to whip up one of his guilty pleasures over the weekend. He made Turkey Burger Sliders! Anyone that knows me knows that I only eat ground beef when I eat out. In my house turkey reigns supreme. Not everyone can cook ground turkey to my liking so I figured I would share with you guys how we do it in the Tamona House! In a bowl, mix the defrosted ground turkey, seasonings, and barbecue sauce of your choosing. Do not worry about using an excessive amount of seasonings. Burgers are always best when you sprinkle a bit of seasoning on top while cooking. Rub the sauce into the meat very well. Add 1/4 cup to 1 lb of turkey if you are making a small batch of sliders. 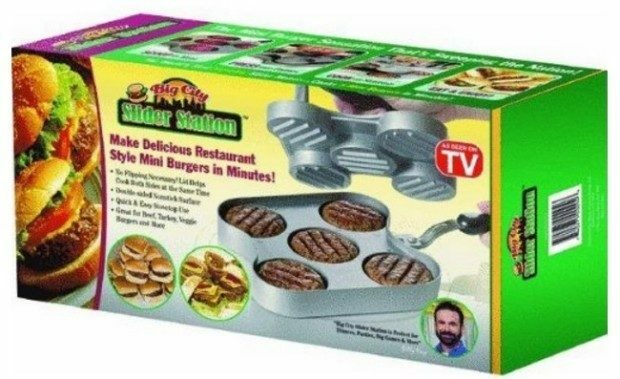 I have one of those slider stations so TD #3 put plastic wrap in the station and used it to make perfectly round sliders. Next, grate a yellow onion over the top of the burgers. If you prefer the onion inside the burger, you can do this while mixing in theseasonings. Grate with the smallest holes on your grater to get the onion flavor that is not overpowering. This is perfect for people who have kids who do not like onions on their burgers (like that kid Tamona). This recipe makes 28 sliders. With any good sliders, you need a delicious slider sauce. We mixed 8oz of sour cream, 1 packet of ranch seasoning (brand does not matter), and 3 tablespoons of Ketchup. Now it is time to cook your sliders. You could always bake them in the oven but we cooked ours on the griddle. We did not need all of the sliders in one day so we put some in the fridge to cook and eat the next day. We served the sliders with corn on the cob and oven fried okra. When you make your sliders, you want to add plenty of that delicious sauce. My children dipped the okra in it and some even put it on their corn.